I look upon school food with deep suspicion; I haven’t spent the last five years nurturing a good and healthy eater only to surrender him to the deep fryer as well as the public education system. And for myself, I refuse to waste $10 a day or more eating lunch out when I can eat better for less in the comfort of my office, listening to Pandora and checking my emails. But it’s hard. It’s really hard to work full-time –particularly when you are the single parent of, and sole provider for a small child — and still prepare home-cooked food for every meal. The savings can be considerable, as can the health benefits, but it comes at tremendous time and energy cost. I get really tired when the semester gets going and really just want to call out for pizza. Often. And order enough to be able to serve it cold for breakfast. I do not at all know how folks who are on a 12-month schedule manage all year long. So I am reducing my pre-semester anxiety by stocking the freezer with all sorts of items that will smooth the transition, things I can pop out for a quick dinner or thaw out and pack for our lunches. It’s a good time to do it. So much produce is at its freshest, cheapest and best in August, and so much of it freezes well with minimal preparation! 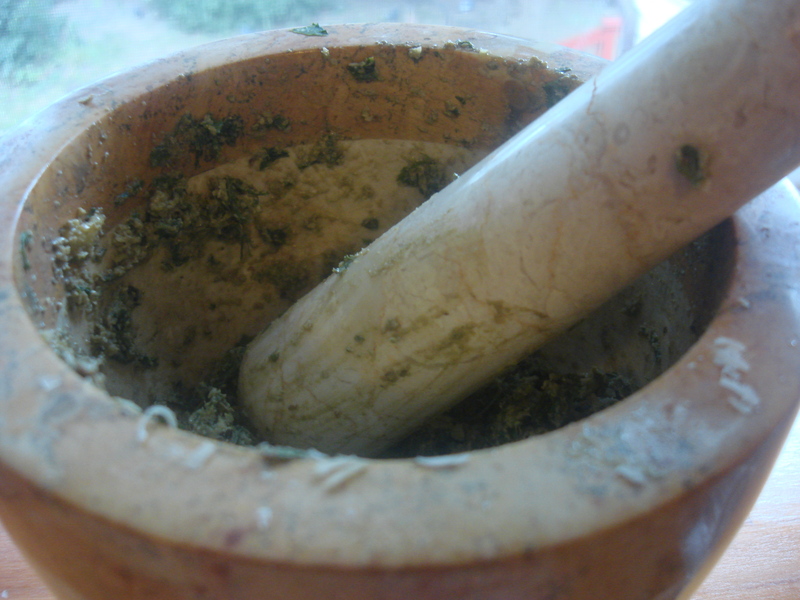 Regular readers know I’ve been making pesto by the mortar and pestle method with my little guy. This time I had more basil, so I decided to let him help me push the buttons on the food processor, for faster prep and a smoother texture. In the winter we can choose which kind we prefer. Some folks blanch the basil leaves in boiling water for just a few seconds, just enough to slightly wilt it, then plunge it in ice water. This is meant to keep the color and preserve the flavor better. I have done it, with mixed results. 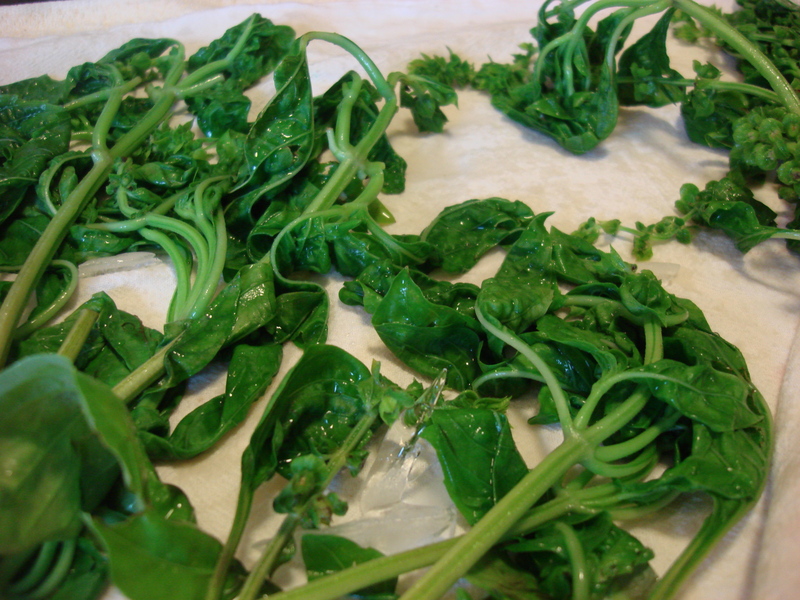 Should you try, make sure to dry the basil thoroughly and immediately or it will darken. Place all ingredients in a food processor and mix until creamy and smooth. Freeze in an ice cube tray (this amount will fill one standard ice cube tray), with a piece of wax paper covering the tray. 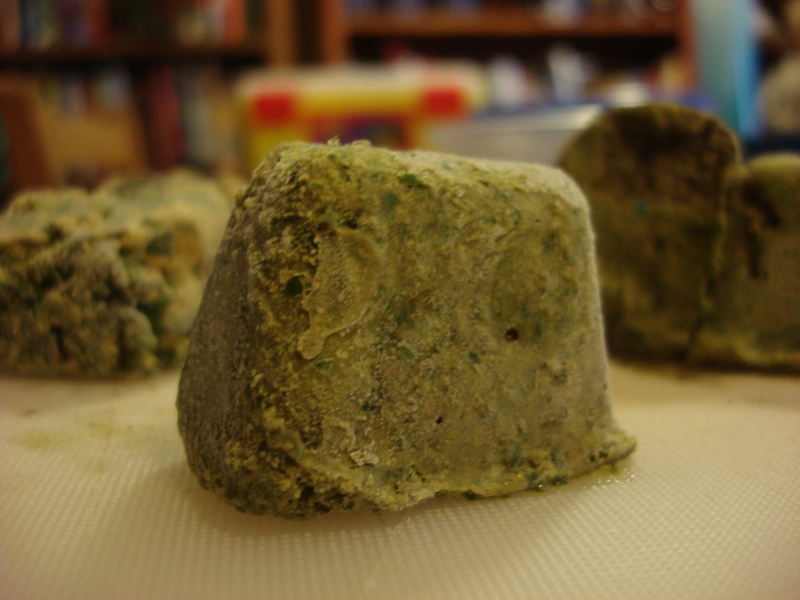 Pop frozen pesto cubes out and store in a freezer bag or other container and use as needed, thawing and adding cheese to taste. Thanks for the visit! These little cubes have saved my sanity more than once, already! I love having pesto in the freezer in winter. It tastes like summer to me more than anything else I can think of saving! Absolutely! And how convenient….Thanks for the comments! Mind you, I am running out of freezer space! Me too! The amazing butcher had free range chicken at ridiculous prices last week and I only had room for two. They were so cheap I wanted to buy ten! He was selling them for the same price you’d pay for a factory farmed bird. Oh! frustration! Or time to send all your buddies over to buy one each and have a huge BBQ…. What a great coincidence – we are about to start our Pesto Possibilities class at 10:30 am, and I was just signing off of my blog when I saw your post. 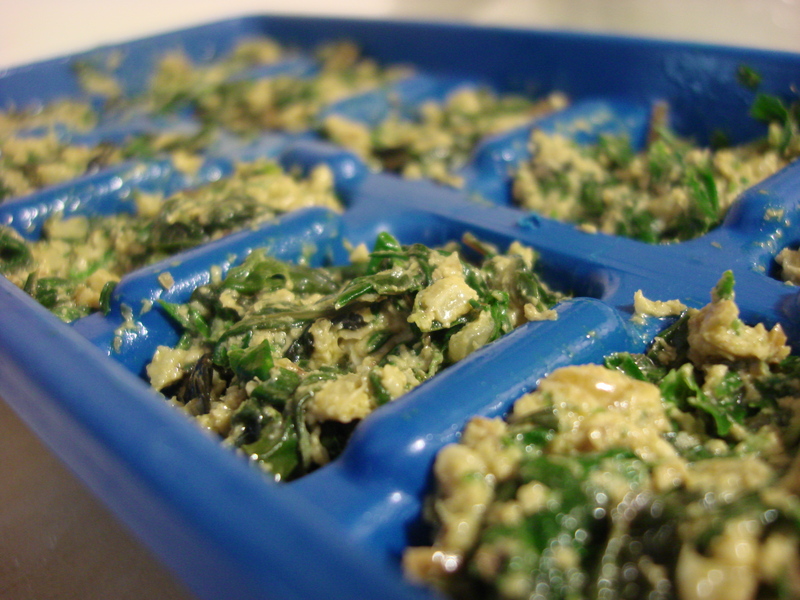 Looks great, and we always use our plastic ice cube trays for pesto. Have you tried using tomato sauce in lieu of olive oil? It is really tasty! I’ll have a post about it Thursday, if you want to take a look. Good luck with school starting! Tomato sauce? Interesting idea!! Will have to see what I can conjure up….Thanks for the visit!